Eureka City Hall is located at 531 K Street, Eureka, CA 95501; phone: 707-441-4144. 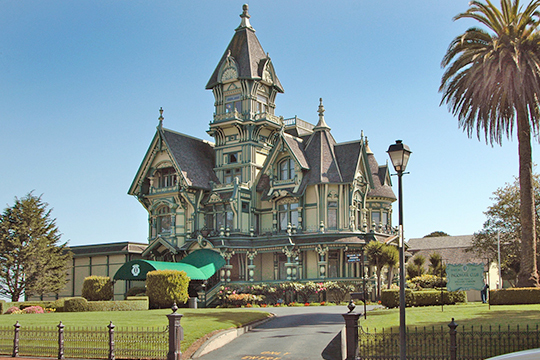 Photo: William Carson Mansion, ca. 1886, 146 M Street, Eureka, CA. Photographed by User:Cory Maylett	(own work), 2005, [cc0-by-1.0 (creativecommons.org/publicdomain/zero/1.0/deed.en], via Wikimedia Commons, accessed March, 2016. Eureka, seat of Humboldt County, on the shore of Humboldt Bay, owes its name as well as the surveying of its first town lots in 1850 to James Ryan, who drove his vessel onto the mud flats, shouting jubilantly "Eureka!" The largest California town north of Sacramento, Eureka spreads in checkerboard fashion over an area large enough to accommodate a population several times its present size. Its solitary houses are scattered over vast stretches of vacant, weed-grown lots. Along the waterfront are the saloons, cheap hotels, and poolrooms of the late nineteenth century relics of the days when the tough, flamboyant life of the lonely, frontier settlement centered here. Today, as in the beginning, when woodsmen and seafarers from New England and Nova Scotia settled here, the great redwood mills along the bay shore dominate the life of the community. On a high plateau overlooking the bay near the southern city limits is Fort Humboldt, where troops were garrisoned for protection against Indians between 1853 and 1865. Ulysses S. Grant was stationed here in 1854 as captain of the Fourth United States Infantry. The life of the lonely post was so dreary that, according to legend, he spent much of his time drinking in Ryan's saloon at Eureka. In the end he resigned from the army out of sheer discouragement. Of the string of offices and barracks that lined the parade ground on three sides, only one, the headquarters of the commissary department, remains today. Restored and repainted, it stands in a landscaped plot enclosed by a white picket fence; inside is a collection of relics, stuffed birds, odd bits of furniture, and yellowing photographs of Grant. Most violent episode of the Indian warfare that prompted establishment of Fort Humboldt was the massacre of a band of Indians by whites, on Indian Island, largest of several small isles in the bay near the waterfront. The remnants of two or three tribes were encamped on the island. On the night of February 25, 1860, when the warriors were away hunting and fishing, white settlers killed all the women and children, the old and infirm. The husbands, fathers, and brothers returning to burned homes and mutilated dead, swore vengeance; and months of bitter warfare followed. When Bret Harte, temporarily in charge of the Uniontown paper, denounced the outrage, he was compelled to return to San Francisco because of threats against his life. The island also called Gunther's Island for the man who later settled on it was thereafter protected from salt water by dikes and turned into farmland. Gunther deeded it to someone, then changed his mind and demolished the dikes by night, allowing the water of the bay to pour over the island and swamp the fields. Eureka's Chinese, like its Indians, were hounded out of town. In 1885 Eureka's Chinatown housed several hundred; as in most small California towns, anti-Chinese prejudice was strong. When, on the evening of February 6, 1885, a Eureka councilman was killed by a stray bullet during an outbreak between warring tongs, feeling was inflamed to the point of mob violence. Cooler heads among the whites assumed command, and at a meeting held in Centennial Hall a committee was appointed to order members of the Chinese colony to leave the county within 24 hours. A scaffold was erected on Fourth Street, and a hangman's noose warned of the intention of the citizens, should their order be disregarded. When rough weather delayed the sailing of ships chartered to take the Chinese to San Francisco, the whites took advantage of the delay to go through the county and issue the same command to the entire oriental population. The Chinese properties were appropriated by Eurekans. A suit was subsequently brought against the city of Eureka for $132,820 but the case never went to trial. Today Humboldt County is one of the few California counties that have no oriental residents. When vessels with Chinese crews dock at Eureka, the sailors do not attempt to go ashore. The Carson Mansion, 2nd and M Streets, is a startling architectural monument. The lumber magnate who built it next door to his lumber yards imported most of the General Grant ornamentation from eastern mills. It stands, carefully preserved, amid sprucely tended grounds. Its jagged roof line, visible from almost any quarter of the city, the tortured ornamentation, and the trim paint give it the air of a prop for a Silly Symphony. The Stump House, on Broadway (US 101), an edifice built of the log and stump of a giant redwood, is likewise a monument to Eureka's chief industry; it houses a collection of articles fashioned from redwood burl and grotesque formations found in redwood forests. In the midst of a redwood grove inside the city is Sequoia Park (picnic tables, playgrounds), surrounding a small lake, which has a zoo with deer and elk paddocks.